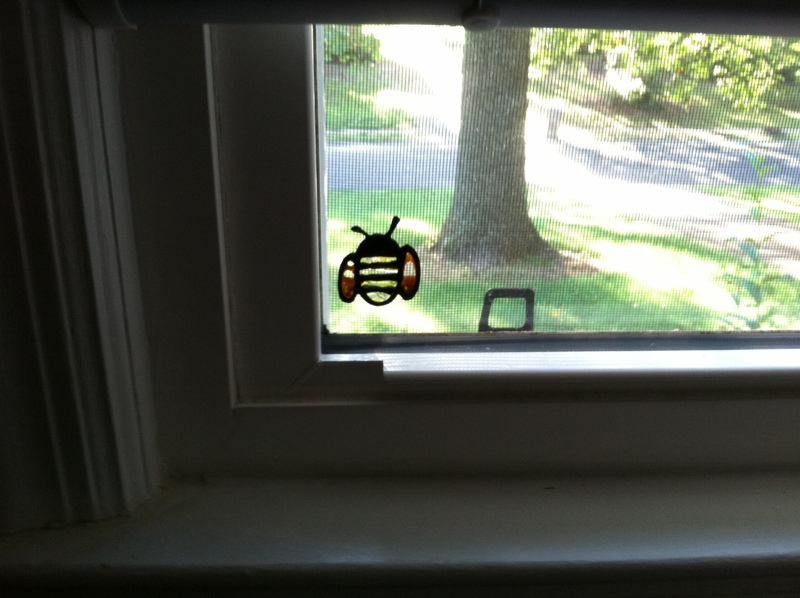 The bee, a faux stained-glass sticker, hangs on the corner of my home office window courtesy of Gigi, my college roommate and forever soul mate and all-around crafty gem. Poor old thing (the bee, not Gigi) has lost its buzz over the past decade as I’ve peeled it off for—count ‘em—three cross-state moves. Its wings and body are worn thin with holes, the yellow and gold colors faded from years in sunlight, one antenna lopped in half. On the surface, nothing remarkable. Just a kitschy gift from a funny, dear friend. Except for the story that goes with it. One night, about fifteen years ago, Gigi and I went to a gathering at the downtown Phoenix apartment of a fellow I was dating. Gigi, lovely, thoughtful person that she is, brought alcohol and a festive little gift: a homemade window-cling bee, which she stuck in that fella’s kitchen window over the sink. At some point, we partygoers left our things and walked to a nearby bar. Long story short, at some point that fellow started ignoring me and flirting mightily with another woman. Ugh. So we beat it the heck out there—only to realize that Gigi’s purse, with the car keys inside, was back at his apartment. No way was I going back in to ask him for a g-d thing. What could we do? “No, wait,” I said, half-running to keep up as she launched herself back toward the apartment. The girl cheetah-walks, even though she’s only 5’2 on a good day. Despite this height fact, she also always believes she’s as tall as the tallest person in the room. At the apartment, Gigi rattled the door and then tested the window. Jackpot. She slid the window open. “Gimme a leg up,” she said. You don’t argue with those eyebrows. I leaned down and cupped my hands. She stepped into my palms, and I hoisted her up. She scrambled inside the window in full view of a busy street, tumbling over the stereo on the way down. She grabbed her purse and started back toward the window but then stopped. She turned back to the kitchen. She ripped that bee off and then climbed back out the window with what I recall as one badass, long-legged, superhero hop to the ground. Yep. She was taller than everyone who ever lived. That little bee has traveled with me from Phoenix, AZ, to Nashville, TN, to Montevallo, Alabama, and now to Charlotte, NC. It’s always in my writing window, right in my line of sight when I look up from typing. Writing is solitary, but you are not alone. You have a hive, and all your people are (ahem) the bee’s freakin’ knees. The families and friends you love are far away, but they are not gone. The families and friends you love who are gone are still present. In memory, in imagination, on the page. Stare out the window. A lot. Fight hard for what’s important, for what you love. You are as tall as those others in the room, so keep on writing, love. Sometimes the world will sting hard and mean in the tenderest of places, and there’s not a thing you can do but weep. You will be afraid. Do it anyway. Give someone a leg up when they need it. Reach back and offer a hand. You live in a house where you have your own window. You live in a house with another human being who makes art across the hall and who also makes you mixtapes and greets you over dinner with stories about starrrrr stuff and news and jokes and other miraculous things from his bright bonfire of an imagination. You are g-d fortunate to be here, bumbling around this bewildering honeycomb of a life. I always seem to want to start my blog posts off with a remark about how much time has passed since I last wrote a post, even though as far as I know, no one’s keeping tabs on my productivity — aside from my bratty Inner Critic, who today is tapping her watch and sighing loudly and rolling her eyes. Pretty soon she’ll start snoring. Twit. Speaking of time, this summer TW and I finally got around to watching Ken Burns’ Baseball, a mere twenty years after its initial release date. (Next up: the films of that hot young director, Alfred Hitchcock!) All 18.5 hours of it. Numb bums aside, it was totally worth it. I learned so much, even as a fan who has more than a passing knowledge. But it wasn’t quite the soaring, euphoric tribute to the game that somehow I expected. Sure, there was plenty of rhapsodizing about monumental moments, about the deep emotional connections within families and communities. But it also tracked the darker side of the game, which of course is entangled in the injustices of American history. Burns famously knows how to tug at the ol’ heart strings, and I often ended up in tears. Most people know about Jackie Robinson, but the film highlights the Josh Gibsons, the Satchel Paiges, the Buck O’Neils, the Curt Floods. So many men with such talent, and the god-awful things they endured. Their faces clear as day, their voices retelling both the lows and highs. At one point, TW patted my back as I wept into my hands, and he said, You know this history. This isn’t new. Exactly: It was old, and persistent, and rooted, even in this game that I have always loved. Of course it was; no part of this country’s hands are clean. Not then, and not now, even as we progress. But then again, it’s baseball, a game that is nothing if not contradictory: perfectly linear and logical and yet twisting and chaotic; individual and collective; sad and joyous; tiny and grand; defeated and triumphant; grounded and mythical; certain and surprising. Games are like stories that way. No wonder writers across the years have been so enamoured. And so in my own meta-baseball-watching, I shouldn’t have been surprised when I was surprised by something that, ahem, came completely out of left field. As we started watching, I kept listening to the narrator, thinking he sounded familiar but unable to pin it down. When the credits rolled, there it was: John Chancellor, the legendary NBC broadcast journalist. And my father’s first cousin. My dad’s father was the youngest of eleven children, and John’s father was one of the older siblings, so John and my father were several years apart. My dad had always hoped to meet John someday, but alas, he never did. (My dad died in 1995; John died in 1996.) In our family, though, we always knew the connection. Everyone always noted how they looked alike. When we’d see him on the news, my mom would say, Yep, just look at their faces. Indeed, I can see the resemblance, in the shape of the face and around the eyes. It’s one of those things that I have always known. What I didn’t know until watching 18.5 hours of a baseball documentary is that they sound alike, too. Over time, I have lost the sound of my father’s voice. This is a normal part of losing someone, but I think it’s one of the harder parts; it’s like that person disappears all over again, years from the initial loss. About a year ago, though, we found some old home videos. There, on the screen, my father moved and spoke and laughed. And there was his voice in my ear again. At first I worried that this would be a setback, that seeing and hearing him again would send me into sadness, but ultimately it was comforting. His voice: a little high, reedy. A twinge of his native Chicago even after living most of his life in California and Arizona. A twinge of me. As we sat this summer watching so many hours of the history of baseball, the narrator’s voice eerily evoking my father’s, I felt my personal history colliding with the collective history. All of those stories coming together in one space– the injustices, the beauty, the grief, the joy — and sharing it with someone I love.